We have our own dedicated servers enabling us to provide cost-effective website hosting, POP3/SMTP and web-based email, etc. all offering the usual 99.9% availability guarantees and superb connectivity. By registering a .uk Domain name, you enter into a contract of registration with Nominet UK on the following terms and conditions. This is a separate contract to any arrangement you may have with any third party for the provision of internet services. Please read before proceeding with a UK domain name order. :)Smilie is also a full member of Nominet UK, which enables us to register UK Domain Names for web projects at a significant discount. Our preferred supplier of International Domain Names is the original (and best), Network Solutions. If you require a Domain name we will conduct research into the availability of names and provide you with a list of alternatives. 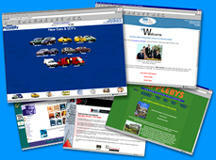 For any on-line project, small or large, the process of publishing a WebSite can be defined in five distinct stages. Each stage requires a varying degree of consultation between ourselves and the client which can be conducted in person or by mail, email, fax or phone. �	The client should have a solid idea of the purpose of their on-line presence. �	Copy and corporate images will usually be provided by the client but areas of specific responsibility will be determined. �	:) Smilie will help identify areas of interest to the client and will ensure the client is comfortable with the basic concept, the basic content and the achievements they can expect of their website. �	The underlying structure of the site is of primary importance - sites that are difficult to navigate or maintain will never succeed however impressive the content. �	:) Smilie will clarify the alternatives available to the client and, after consultation, will produce a working template to ensure the site will work efficiently and smoothly. �	Smaller sites are generally built with standard HTML pages, larger sites are more often data driven, creating a more dynamic user environment. �	Page layout and construction, image manipulation, bespoke graphics and imagemaps, stock graphics and pictures, video and audio clips, feedback form design, database integration, search engines, HTML, Java, Shockwave and Perl scripting. �	At this stage we combine all the required elements of the client's website into a solid and pleasing whole. The client can review work in progress at any time to offer their opinion and ensure their approval. �	The website will be uploaded either to our own server or the client's chosen host. �	Every component of the site is fully tested. �	Once the site has been thoroughly checked the process of registration and marketing begins. The client's site will be registered with search engines, press releases despatched and submissions to on-line communities made. �	Full training will be given on all systems installed. �	An important consideration, often overlooked. Some sites innately require regular maintenance. This could be changing copy, audio, visuals or product and company details. Anticipated maintenance can be flexibly negotiated. �	However, as technologies advance and fashions change, clients may wish to make unenvisaged changes to their sites. �	:) Smilie offer maintenance packages or will negotiate as and when required.